We offer sectional garage doors produced with advantages of latest technological solutions and modern design which meet expectations of most demanding clients. Highest quality of materials used for the production ensures many years faultless operation. While offering our products we are trying to ensure maximum safety of their use according to safety regulations. For production of sectional doors galvanised steel sheets filled with polyurethane foam of 40mm thickness are used which ensure excellent thermal insulation characteristics and acoustics insulation. 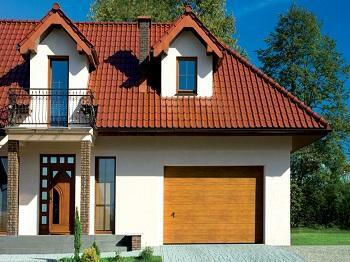 There are two basic types of segmented doors – automated and manually operated. Apart from traditional simple models of doors we can also offer wood resembling doors available in full range of colours. 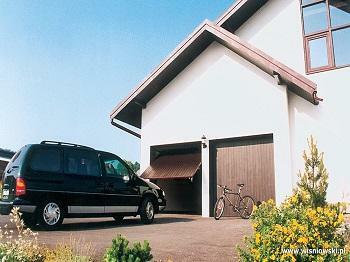 We present new drive system for garage doors with shaft and torsion springs which enable simple installation. Thanks to adoption of this system the doors can be installed by a single person. The sets of rails are delivered with screw or rivet joints options. System with torsion springs can be used with all 40mm panels. It is delivered as assembled set with the doors or as separate components. We offer professional, quick, qualified and timely installation of ordered products. Our installation teams comprise of technicians with many years of experience in installation of sectional doors. System with shaft and torsion springs is extraordinary durable and stable structure. Our sectional doors are designed with Finger Protection system which prevents fingers being caught between doors segments during manual opening or closing of the doors. Spring break result protection which prevents uncontrollable free fall of doors if springs break off – this is standard equipment for doors without electric drive. Protection from cable break – standard protective feature of industrial doors preventing rapid door fall down in case of cable breakdown. Shoot bolt preventing breaking in – standard protection against intruders. Photocells protecting against incidental crushing – additional protection installed for doors with electrical drive – the doors open when an obstacle appears in the light path of the photocells.